During consecutive days when Tibetans have offered up their lives for the cause of Tibet’s national freedom in the comfort of exile Mr Lobsang Sangay, recently renamed as Tibetan ‘Political Leader’, was offering his thoughts on Tibet to a gathering In Prague. His words could not have been any more at odds with ongoing resistance inside Tibet, indeed his remarks were a breath-taking betrayal of the very goal sought by the brave Tibetan people, whose protests, collective and individual have repeatedly demanded Tibet’s rightful independence. Tragically Lobsang Sangay and his Administration are seeking a very different solution to that of his compatriots, as indicated by his comments to a Czech news agency. Unlike the courageous Tibetans who daily face China’s brutal oppression, yet still demand Tibetan national freedom, his objective is that ‘Tibetan people should have a fair share in the administration, economy, education, environment and other issues’. 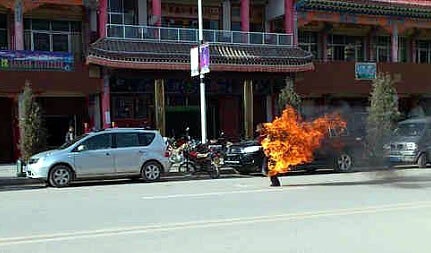 It is a great sadness that while Tibetans offer up their lives in fiery sacrifice demanding an independent Tibet, or face Chinese torture and bullets to raise the Tibetan national flag Lobsang Sangay is serving up words of appeasement and treachery!